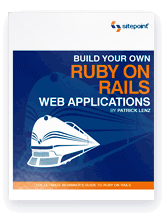 I’m very happy to announce that for the next 60 days our book Build Your Own Ruby on Rails Applications is FREE* in PDF Format (a $29.95 USD value). Thatâ€™s rightâ€¦ Not an extract… Not a sample chapterâ€¦ The ENTIRE 447 pages of Patrick Lenzâ€™s incredible book is (for the next 60 days) free to download. Itâ€™s no wonder this book has been described as the best Ruby on Rails beginnersâ€™ book on the market. By the way, if you prefer your books in hardcopy format, you can still pick up a print copy directly from us or any major bookstore. * Youâ€™re this far down the page and havenâ€™t already skipped away to download, so I take it you’re looking for the catch, the fine print, or the terms and conditions that may apply. Sorry, but there aren’t any! This offer is as amazing as it seems — a free download of a print-quality book. End of story. Remember: itâ€™s 60 days of Rails madness, not 61, so donâ€™t miss out! But if you really want to give us something in return, donations of premium alcoholic beverages, schwag, and gadgets will be kindly accepted.